SE MODMAX pedals: ringmod & filter together at last. 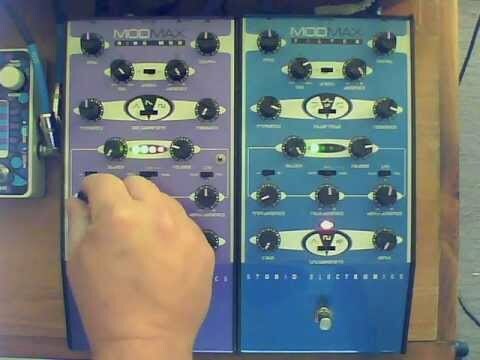 just got the Studio Electronics MODMAX ringmod, so I tested it out with a simple bassline and twisted knobs. I have never seen a demo of it on youtube, so this might be the first. I realize there are a lot of squealy things here, but you can dial in some bizarre stuff and let your instrument's volume interact with the trigger for variations. Not boring, for sure. I love bassy stuff, but I think it shines on high frequencies. Also, there's an input in the back that allows you to add another signal to the waveform without losing the internal oscillator. Pretty cool. Had the MOOG, this is (gulp) way more fun. IMHO, of course. You will always be my pal.